Crypto-CoinZ.net is a new specialized crypto portal for miners and crypto enthusiasts. They provide a multi coin / multi algorithm profits comparison calculator that includes every Equihash and NeoScrypt based crypto currencies, as well as several X11, Xevan, Tribus, Lyra2Z and Skunkhash altcoins. Bitcoin Gold has also been included in there with the service claiming it to be the first profit calculator for the new coin out there and miners are able to see what they are making in mining profits. 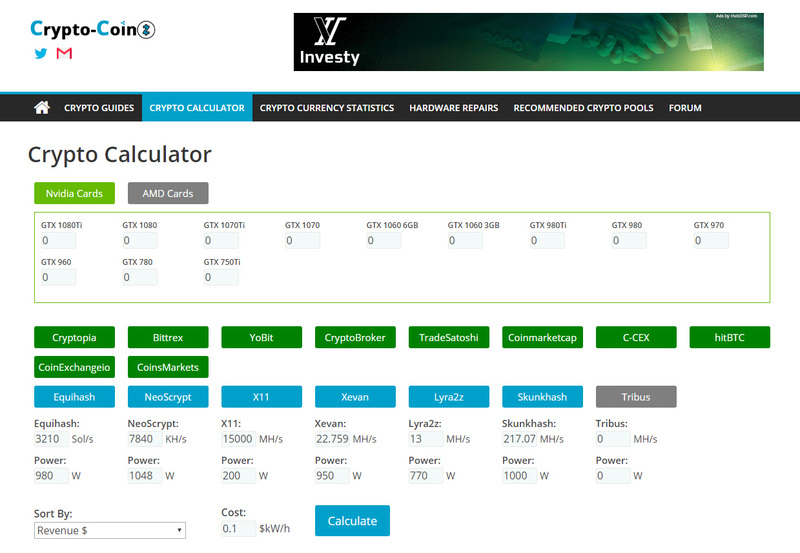 The mining calculators have a built-in functionality to directly select the type and the number of AMD or Nvidia video cards and to automatically get the corresponding hashrate needed for the profitability calculations. The information in the video cards list with Hash to Power used has been compiled with the help of multiple pools and miners and provides values for every Nvidia video card going back to the GTX 7XX series and for most of the more recent AMD video cards as well. One feature that sets apart this mining profitability calculator service is that with every calculation the users can see links to the coins official website, block explorer and recommended mining pools. The recommended pools list provides in one place the location of the pools and their mining fee, so miners can choose which pool will fit them best and go there directly after finding a new profitable coin to switch to. The team behind the website has also recently started sharing technical crypto guides on interesting topics and a hardware repair section, which can be really useful for everyone who wants to restore their old mining cards back to glory for instance. The site is also provides monitoring of the Network Hashrate and Difficulty for all of the coins present in the calculator, allowing miners to check the last 90 days of the performance of the network.